What is Intense Pulsed Light? IPL or Intense Pulsed Light is the process of using specific wavelengths of light to provide a range of aesthetic and therapeutic treatments. IPL is different to laser based therapies that only produce a single wavelength of light and can therefore only treat a specific condition. The SkinBase IPL can be used for a wide range of treatments including hair reduction, photorejuvenation, acne and vascular lesions. The SkinBase IPL also features a unique cooling cryo-handset. The cryo-handset creates an anaesthetic effect on the skin surface to provide the most comfortable treatment experience. Unlike laser based therapies that can only treat a specific condition, The SkinBase™ IPL uses cut off filters to provide a range of wavelengths. These cut off filters selectively filter out the unwanted wavelengths of light. The remaining light is then used to treat a specific structure. In the case of photorejuvenation the light energy targets the red blood cells in the blood vessels. The light passes through the skin and is absorbed by the vessel wall or pigment. This heat energy causes damage to the vessel or pigment and the body’s natural repair mechanisms take over and remove the damaged tissue. The results are fresher looking & smoother skin. When used for hair reduction the light is absorbed by the melanin in the hair and is converted into heat. This damages the follicle making it unable to support further hair growth. The number of treatments required will vary but you should expect to see significant results within 3-6 treatments. A full course of 6 to 10 treatments may be required to achieve long lasting results. Treatments should be no more than every 3-4 weeks on each area being treated. IPL is a light based therapy that works by targeting structures within the skin such as melanin, blood, and water in collagen with wavelengths of light to breakdown the structure and improve the appearance of the skin. The light pulses also stimulate collagen production which floods to the area plumping the skin and reducing wrinkles, resulting in a more youthful appearance. As the treatments are both non-surgical and non-invasive you can see substantial results with no downtime. You can return to work straight away. The SkinBase IPL can be used for a wide range of treatments making it an option for all skin types of all ages. Pigmentation, unwanted hair, thread veins, acne or improving general skin tone and fine lines, are just a few of the treatments available with the SkinBase IPL. Some less advanced IPL systems can only be used on a limited amount of skin types but The SkinBase IPL has been clinically proven to work on almost all skin types except very dark skin. Unlike other IPL systems The SkinBase IPL system allows the practitioner to fine tune the settings to suit specific skin and hair combinations and obtain the best results possible. Your SkinBase IPL practitioner will carry out a comprehensive consultation and patch test and advise you of the results you can expect to achieve. Use our guide below to see what skin type you are before your first consultation. The SkinBase IPL can be used to treat a wide range of conditions successfully. Our therapists have had fantastic results from hair reduction to acne. Take a look at some of our before and after photos to see what can be achieved or read the the more detailed information below on the various treatments the SkinBase IPL offers. Destroys the bacteria on the skin preventing new spots occurring. Prevents over-production of sebum and dramatically reduces inflammation. Stimulates collagen production reducing the appearance of scarring and improving skin texture. 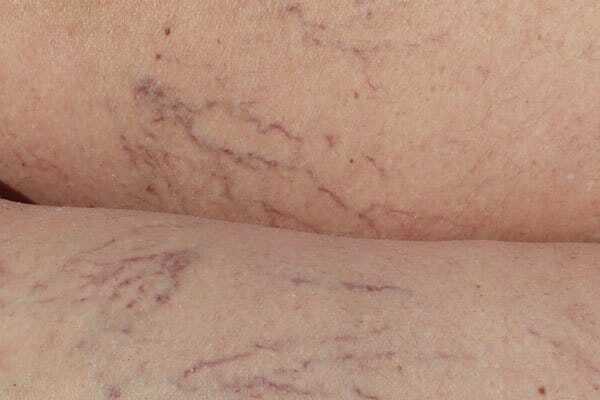 Treats thread veins and rosacea in as little as two or three treatments. Remove campbell de morgan spots / cherry angiomas. Treats sun damage including age spots and pigmentation. Reduces redness and uneven pigmentation. Effectively reduces fine lines and wrinkles. Skin looks smoother and more even in appearance. One of the most popular and well known treatments for IPL is the reduction of unwanted hair. Just think of the time you spend on waxing and shaving let alone the costs of the products. The SkinBase IPL has proven itself time and again for permanent hair reduction. A skin test must be carried out before any IPL treatments. A cost of £25 for an in-depth consultation and patch test will be redeemed at your first IPL treatment. Is The SkinBase IPL treatment safe? The SkinBase IPL system is a Medically CE certified system that has been independently tested and verified by one of the country’s leading experts on IPL. Is The SkinBase IPL painful? The system features a unique cryo-cooling handset which has an anaesthetic effect on the skin surface to provide the most comfortable treatment experience. So, although you may feel some mild discomfort during the treatment this is rare. The quick answer; IPL works using high intensity light to target specific structures within the skin. The structures are damaged by the heat generated and removed by the body’s natural repair process. Unwanted hair can be removed from most parts of the body including legs, upper lip & chin, bikini line, underarm, back. Medical treatments can also be performed on most areas of the body. For permanent hair reduction most areas of the body will need between 6-10 treatments however this can vary from client to client. Medical treatments such as acne or thread vein removal however may only require 1-3 treatments. Your SkinBase IPL therapist will assess your individual requirements and advise accordingly. SkinBase IPL has been clinically proven to work on almost all skin types except very dark skin. How does it feel – hair reduction? A slight warm tingling sensation best describes the feeling experienced during a SkinBase IPL treatment. The SkinBase IPL is much more comfortable than most conventional methods like waxing, laser and electrolysis. How does it feel – medical treatments? Most people liken the feeling to being flicked lightly with an elastic band. The special cooling handset is applied to the skin prior to treatment to ensure the treatment is as comfortable as possible. The price will depend on the area being treated, the treatment required and the number of treatments required. Most practitioners will offer discounted rates when booking a course of treatments rather than “one off” therapies.